In mathematics differential calculus is a subfield of calculus concerned with the study of the rates at which quantities change. It is one of the two traditional divisions of calculus, the other being integral calculus. Fermat had recourse to the principle of the economy of nature. Heron and Olympiodorus had pointed out in antiquity that, in reflection, light followed the shortest possible path, thus accounting for the equality of angles. During the medieval period Alhazen and Grosseteste had suggested that in refraction some such principle was also operating, but they could not discover the law. Fermat, however, not only knew (through Descartes) the law of refraction, but he also invented a procedure—equivalent to the differential calculus—for maximizing and minimizing a function of a single variable. ...Fermat applied his method ...and discovered, to his delight, that the result led to precisely the law which Descartes had enunciated. But although the law is the same,ssumed that the speed of light in water to be less than that in air; Descartes' explanation implied the opposite. An untold amount of intellectual energy has been expended on the quadrature of the circle, yet no conquest has been made by direct assault. The circle-squarers have existed in crowds ever since the period of Archimedes. After innumerable failures to solve the problem at a time, even when investigators possessed that most powerful tool, the differential calculus, persons versed in mathematics dropped the subject, while those who still persisted were completely ignorant of its history and generally misunderstood the conditions of the problem. ...But progress was made on this problem by approaching it from a different direction and by newly discovered paths. Lambert proved in 1761 that the ratio of the circumference of a circle to its diameter is incommensurable. Some years ago, Lindemann demonstrated that this ratio is also transcendental and that the quadrature of the circle, by means of the ruler and compass only, is impossible. He thus showed by actual proof that which keen minded mathematicians had long suspected; namely, that the great army of circle-squarers have, for two thousand years, been assaulting a fortification which is as indestructible as the firmament of heaven. J.M. Child... has made a searching study of Barrow and has arrived at startling conclusions on the historical question relating to the first invention of the calculus. He places his conclusions in italics in the first sentence as follows Isaac Barrow was the first inventor of the Infinitesimal Calculus... Before entering upon an examination of the evidence brought forth by Child it may be of interest to review a similar claim set up for another man as inventor of the calculus... Fermat was declared to be the first inventor of the calculus by Lagrange, Laplace, and apparently also by P. Paul Tannery, than whom no more distinguished mathematical triumvirate can easily be found. ...Dinostratus and Barrow were clever men, but it seems to us that they did not create what by common agreement of mathematicians has been designated by the term differential and integral calculus. Two processes yielding equivalent results are not necessarily the same. It appears to us that what can be said of Barrow is that he worked out a set of geometric theorems suggesting to us constructions by which we can find lines, areas and volumes whose magnitudes are ordinarily found by the analytical processes of the calculus. But to say that Barrow invented a violence to the habit of mathematical thought and expression of over two centuries. The invention rightly belongs to Newton and Leibniz. The chief object of the present work is, as its title indicates, to furnish to the student examples by which to illustrate the processes of the Differential and Integral Calculus. In this respect it will be seen to agree with Professor Peacock's Collection of Examples ; and indeed if a second edition of that excellent work had been published I should not have undertaken the task of making this compilation. But as Professor Peacock informed me that he had not leisure to superintend the publication of a second edition of his "Examples" which had been long out of print, I thought that I should do a service to students by preparing a work on a similar plan, but with such modifications as seemed called for by the increased cultivation of Analysis in this University. Fermat applied his method of tangents to many difficult problems. The method has the form of the now-standard method of differential calculus, though it begs entirely the difficult theory of limits. One may regard Fermat as the first inventor of the new calculus. In his method De maximis et minimis he equates the quantity of which one seeks the maximum or the minimum to the expression of the same quantity in which the unknown is increased by the indeterminate quantity. In this equation he causes the radicals and fractions, if any such there be, to disappear and after having crossed out the terms common to the two numbers, he divides all others by the indeterminate quantity which occurs in them as a factor; then he takes this quantity zero and he has an equation which serves to determine the unknown sought. ...It is easy to see at first glance that the rule of the differential calculus which consists in equating to zero the differential of the expression of which one seeks a maximum or a minimum, obtained by letting the unknown of that expression vary, gives the same result, because it is the same fundamentally and the terms one neglects as infinitely small in the differential calculus are those which are suppressed as zeroes in the procedure of Fermat. His method of tangents depends on the same principle. In the equation involving the abscissa and ordinate which he calls the specific property of the curve, he augments or diminishes the abscissa by an indeterminate quantity and he regards the new ordinate as belonging both to the curve and to the tangent; this furnishes him with an equation which he treats as that for a case of a maximum or a minimum. ...Here again one sees the analogy of the method of Fermat with that of the differential calculus; for, the indeterminate quantity by which one augments the abscissa x corresponds to its differential dx, and the quantity ye/t, which is the corresponding augmentation [Footnote: Fermat lets e be the increment of x, and t the subtangent for the point x,y on the curve.] of y, corresponds to the differential dy. It is also remarkable that in the paper which contains the discovery of the differential calculus, printed in the Leipsic Acts of the month of October, 1684, under the title Nova methodus pro maximis et minimis etc., Leibnitz calls dy a line which is to the arbitrary increment dx as the ordinate y is to the subtangent; this brings his analysis and that of Fermat nearer together. One sees therefore that the latter has opened the quarry by an idea that is very original, but somewhat obscure, which consists in introducing in the equation an indeterminate which should be zero by the nature of the question, but which is not made to vanish until after the entire equation has been divided by that same quantity. This idea has become the germ of new calculi which have caused geometry and mechanics to make such progress, but one may say that it has brought also the obscurity of the principles of these calculi. And now that one has a quite clear idea of these principles, one sees that the indeterminate quantity which Fermat added to the unknown simply serves to form the derived function which must be zero in the case of a maximum or minimum, and which serves in general to determine the position of tangents of curves. But the geometers contemporary with Fermat did not seize the spirit of this new kind of calculus; they did not regard it but a special artifice, applicable simply to certain cases and subject to many difficulties, ...moreover, this invention which appeared a little before the Géométrie of Descartes remained sterile during nearly forty years. ...Finally Barrow contrived to substitute for the quantities which were supposed to be zero according to Fermat quantities that were real but infinitely small, and he published in 1674 his method of tangents, which is nothing but a construction of the method of Fermat by means of the infinitely small triangle, formed by the increments of the abscissa e, the ordinate ey/t, and of the infinitely small arc of the curve regarded as a polygon. This contributed to the creation of the system of infinitesimals and of the differential calculus. 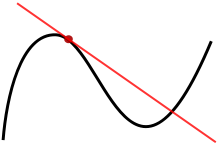 This great geometrician expresses by the character E the increment of the abscissa; and considering only the first power of this increment, he determines exactly as we do by differential calculus the subtangents of the curves, their points of inflection, the maxima and minima of their ordinates, and in general those of rational functions. We see likewise by his beautiful solution of the problem of the refraction of light inserted in the Collection of the Letters of Descartes that he knows how to extend his methods to irrational functions in freeing them from irrationalities by the elevation of the roots to powers. Fermat should be regarded, then, as the true discoverer of Differential Calculus. Newton has since rendered this calculus more analytical in his Method of Fluxions, and simplified and generalized the processes by his beautiful theorem of the binomial. Finally, about the same time Leibnitz has enriched differential calculus by a notation which, by indicating the passage from the finite to the infinitely small, adds to the advantage of expressing the general results of calculus, that of giving the first approximate values of the differences and of the sums of the quantities; this notation is adapted of itself to the calculus of partial differentials. Pierre Simon Laplace, Essai philosophique sur le calcul des probabilities (1812) Tr. F.W. Truscott and F.L. Emory, A Philosophical Essay on Probabilities by Pierre Simon Marquis de Laplace (1902) Part I, Chapter V, p. 46 as quoted by Cajori, ibid. To prove the laws of motion by the law of gravitation would be an inversion of scientific order. We might as well prove the law of addition of numbers by the differential calculus. In the beginning of the year 1665 I found the method of approximating series and the rule for reducing any dignity [power] of any binomial to such a series [ i.e. the binomial theorem ]. The same year in May I found the method of tangents of Gregory and Slusius, and in November had the direct method of Fluxions [i.e. the elements of differential calculus], and the next year in January had the Theory of Colours, and in May following I had entrance into the inverse method of Fluxions [i.e. integral calculus], and in the same year I began to think of gravity extending to the orb of the moon … and having thereby compared the force requisite to keep the Moon in her orb with the force of gravity at the surface of the earth, and found them to answer pretty nearly. All this was in the two years of 1665 and 1666, for in those years I was in the prime of my age for invention and minded Mathematicks and Philosophy more than at any time since. Bernhard Riemann, Die partiellen Differentialgleichungen der mathematischen Physik [The Partial Differential Equations of Mathematical Physics] (1882) as quoted by Robert Édouard Moritz, Memorabilia Mathematica; Or, The Philomath's Quotation-book (1914) p. 239. Fermat is... honored with the invention of the differential calculus on account of his method of maxima and minima and of tangents, which, of the prior processes, is in reality the nearest to the algorithm of Leibniz; one could with equal justice, attribute to him the invention of the integral calculus; his treatise De æquationum localium transmutatione, etc., gives indeed the method of integration by parts as well as rules of integration, except the general powers of variables, their sines and powers thereof. However, it must be remarked that one does not find in his writings a single word on the main point, the relation between the two branches of the infinitesimal calculus. P. Tannery, "Fermat" in La Grande Encyclopédie (Berthelot) as quoted by Cajori, op. cit. This page was last edited on 21 October 2017, at 21:35.